This recipe is so delicious. 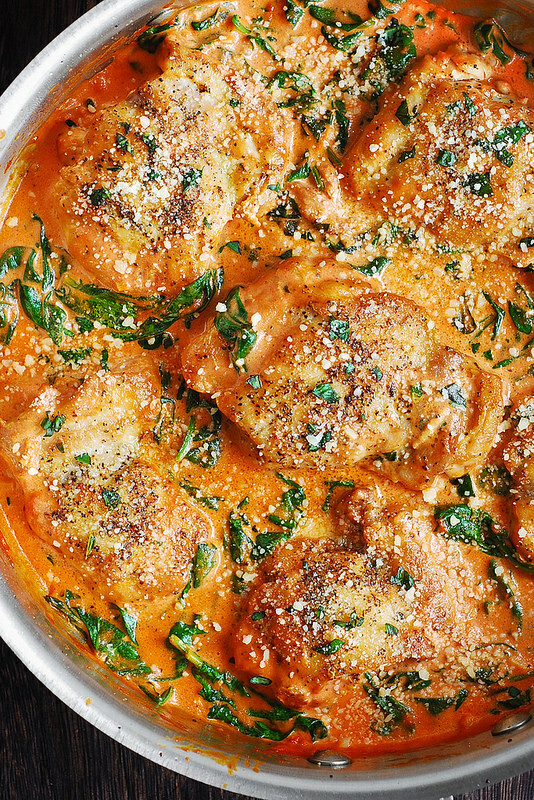 It takes very little time to make - yet is very satisfying with an easy-to-make creamy tomato and spinach sauce. We exchange the heavy cream usually found in this dish, for coconut cream. You can use marinara sauce in place of the tomato sauce for another depth of flavor. Muir Glen makes a product without sugar or artificial sweeteners in the healthy food department at Kroger. Serve with a side of cauliflower rice, roasted vegetables, or over spaghetti squash or zucchini noodles, and you have a very memorable meal. Heat oil in a large stainless-steel skillet on medium heat. Season chicken thighs with sea salt & pepper. Place thighs (top side down) into hot skillet. Once nicely browned, flip over to the other side and brown. (Approx. 5 minutes each side) Set aside on a plate and keep warm. In the same skillet, add tomato sauce, garlic and coconut cream. Bring to a boil, stirring constantly, then reduce to simmer. Add fresh spinach, stirring until just wilted. Adjust any salt & pepper seasoning. Add chicken back into skillet. Continue simmering chicken until completely cooked and no longer pink in the center (10-15 minutes). Sprinkle with chopped basil and serve.